Ethnic Albanians in Kosovo are being executed and expelled from their villages by the Serbian army, reports of attrocities are filtering out with the thousands of refugees crossing into Macedonia, Montenegro and Albania. 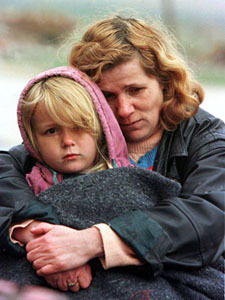 This woman and child who were photographed 17 Mar '99 in Glogovac, some 35kms. northwest of Pristina, were fleeing Serb forces attacking in the Drenica region even as the Paris talks attempted to avert a Nato attack. Vuc Draskovic, Deputy Primeminister of Yugoslavia complains 28 Mar '99 that Nato air strikes against his country are themselves evidence of "a break-down of morality". Page: |1. |2. |3. |4. |Index.